Gideon Ariel was on the phone telling someone that he could make Ken Norton the greatest fighter in the world, or at least able to beat Larry Holmes the next time they fought. "Norton is stronger, but has slower reflexes by 20 milliseconds. So he should stand closer to Holmes to mitigate his speed, take it away from him. A few minutes later Ariel sat down at his computer keyboard. With the touch of Peter Nero doing an arpeggio, he tapped out a "tune," which appeared on a pitch-black screen to his left, an aqua stick-figure of a golfer going through a full swing. Amazingly, the erector-set-in-motion looked familiar; there was the big turn of the shoulders, the right one dipping rather steeply, and especially a pronounced forward thrust of bent knees at impact that resembled Jack Nicklaus. Indeed, that is who it was. screen, first to a code-lettered box then to Nicklaus' right knee joint, which the dot pushed backward. That done, the dot skirted back to the codelettered box then to the joint of Nicklaus' left knee, shoving it forward. With both knees bowed. Jack Nicklaus looked like an old cowhand. The dot disappeared. Ariel reset the knees to conventional address position. and the stick figure was again put through a full golf swing. At impact this time. the knees flared in and out in the manner of a dancer doing the Charleston. It was a funny sight. Even Nicklaus would have laughed. But Gideon Ariel was not passing the time playing a video game. You won't find his equipment in any local arcade. It is a highly sopttisticated and expensive combination of units. a Super Sports Analyzer Projector that projects slow - motion film of golfers. javelin throwers, sprinters, baseball pitchers. etc., in action onto a large screen, a GrafPen Digitizer that traces those movements, a Data General Nova 3/D computer that banks the information gathered on those movements and plays it out instantly on demand. And a smaller screen on which this orchestration is given a new life. Ariel uses his equipment to obtain and measure data on each body ovement-veloxity, rate of acceleration and deceleration, location of center of gravity, joint forces and moments of force. He then can interpret the significance, or contribution, of each body segment to the entire motion. He also can formulate theoretical txxly movements to see whether any of them might be more effective than the real thing. If there were a universal, a perfect golf swing. Ariel could create it on his equipment. But, says Ariel. no such thing exists because everyone is built differently. Which takes care of golfs Holy Grail. 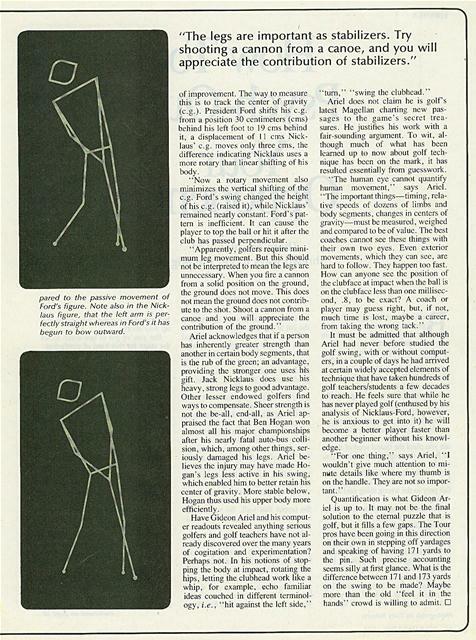 Aricl concedes, however, that the individual can rimake his own perfect swing. Which gets us back to the quest. Jack Nicklaus doing the Charleston at impact won't produce a better golf shot. The example is an exaggeration to show Ariel's equipment capability. But he has created less bizarre simulations that have brought actual changes in athletic techniques. and consequently improved performance. Using simulation and/or analysis of "straight" material, Ariel helped U.S. Olympic shot-putter Terry Albritton set a new world record. So Gideo n Ariel is not fooling around. He is deeply and professionally involved in the hiomechanical analysis of athletic movement, an area of study within the general field of sports medicine that is begioninf to have significant impact on athletics. From this field are coming new, improved and sometimes safer techniques and equipment. For example, Ariel has a patent pending on an inflatable athletic shoe designed to improve the foundation from which almost all athletics build. Air is injected through the heel to form the innersole precisely to the shape of the individual foot. One does indeed walk o n air, packaged air. A number of other persons are currently working in the field of biomechanics in sport, but Gideon Ariel, a 39-year-old Israeli, who has been living in the United States for the past 14 years. is perhaps the best known. This may be due in part to Ariel's enthusiasm, which in turn may be a personal compensation. A poor athlete as a youth who wanted to excel in sports, at 17 Ariel was drawn to the discus throw, labored at it with exceeding fervor and became good enough to make the 1960 and 1964 Israeli Olympic teams. His best Olympic toss was 171 feet, far back in the pack ("I was too nervous." he says now. "and I must say that science cannot do anything about that-yet"). After earning his masters' degree from the School of Exercise Science at the University of Massachusetts. he took courses in computer programming, eventually going into the motion business full-time and on his own by forming Computerized Biomechanical Analysis, Inc. in Amherst. Despite his science/math background Ariel has a gift for metaphor. for phrases that simplify his scientific findings and convey than colorfdly, His English recalls Israeli Prime Minister Menachem Begin in serious moments, a Jewish-dialect comedian in lighter ones. In Ariel-ese. feet are "fit," cats, are "kets" and, "De formation of de bends. de gulf grip. is importan. But not so much as pipple tink. If you hev a perfect grip and de ahdder parts are not right, it's like heving a diamond studded ignition key for a rotten 1945 car." If the old Scottish pros could get through with their brogue. why not an Israeli scientist? 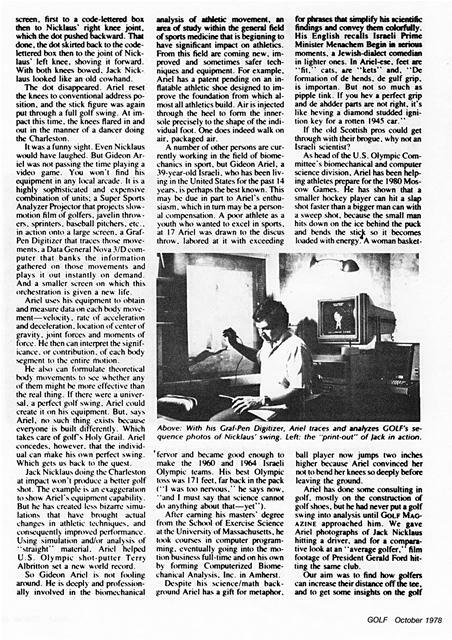 As head of the U.S. Olympic Committee's biomechanical and computer science division. Ariel has been helping athletes prepare for the 1980 Moscow Games. He has shown that a smaller hockey player can hit a slap shot faster than a bigger man can with a sweep shot, because the small man hits down on the ice behind the puck and bends the stick so it becomes loaded with energy. A woman basket ball player now jumps two inches higher because Ariel convinced her not to bend her knees so deeply before leaving the ground. Ariel has done some consulting in golf. mostly on the construction of golf shoes, but he had never put a golf swing into analysis until GOLF MAGAZINE approached him. We gave Ariel photographs of Jack Nicklaus hitting a driver, and for a comparative look at an "average golfer." film footage of President Gerald Ford hitting the same club. Above: With his Graf-Pen Digitizer, Ariel traces and analyzes GOLF's sequence photos of Nicklaus' swing. Left: the "print-out" of lack in action. "President Ford actually has a smoother and faster over-all swing than Nicklaus but his timing is not as good. He can't snap the club as well." swing as a whole that would prevail for all golfers. To the latter. Ariel the scientist cannot commit himself fully. again because of physical differences. He allows, though, that in certain basic respects what Jack Nicklaus does and Gerald Ford does not do can be reasonable guidelines for the Everygolfer. Those "basics" are what follow. Ariel concentrated his analysis on the downswing, after concluding that the backswing was not especially important. "The downswing is where everything starts and what makes everything happen." Where it happens most is at impact with the ball. The positions of the hands and club at this moment are extremely vital. In his analysis, Ariel writes: "The application of force is most efficient when it is applied at a perpendicular angle, in other words. when the shaft is perfectly vertical at impact. Jack Nicklaus at impact is almost perpendicular-a mere one degree short. Gerald Ford is 30 degrees past perpendicular; he uncocks his hands too %(x)n. The club is losing velocity as it hits the ball, so Ford cannot hit it as far as he might. Should golfers conscious!. uncork their wrists so the club is perpendicular at impact? Do the hands supply the most power? Ariel: "The hands have to be held back at the start. I think Nicklaus does it by starting his hands almost straight down, like when you pull a window shade. The radius of circle he makes coming down is very small. He is also loading his club with more energy. Ford makes more of a parabola. which is weaker, and which causes his wrists to uncock too son. "The hands provide power. but only as a result of what the big, heavy muscles do; the trunk, hips. legs, shoulders do the real work. A violinist trying to play very quickly using only his forearms and wrists goes slower. Same idea in golf. 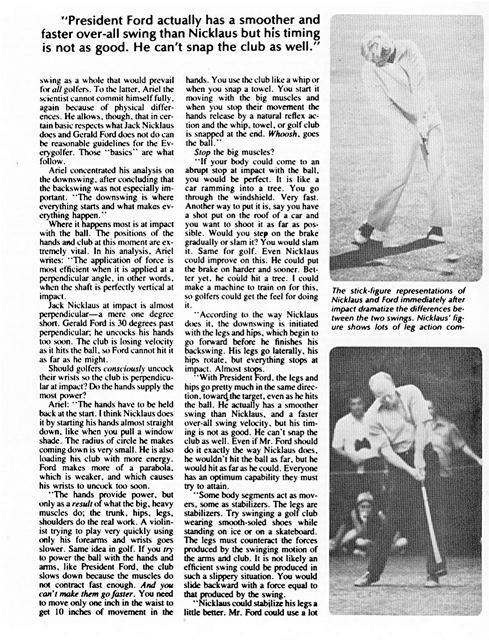 If you try to power the ball with the hands and arms, like President Ford, the club slows down because the muscles do not contract fast enough. And you can't make them go faster. You need to move only one inch in the waist to get 10 inches of movement in the hands. You use the club like a whip or when you snap a towel. You start it moving with the big muscles and when you stop their movement the hands release by a natural reflex action and the whip, towel, or golf club is snapped at the end. Whoosh, goes the ball." -If your body could come to an abrupt stop at impact with the ball. you would be perfect. It is like a car ramming into a tree. You go through the windshield. Very fast. Another way to put it is. say you have a shot put on the roof of a car and you want to shoot it as far as possible. Would you step on the brake gradually or slam it? You would slam it. Same for golf. Even Nicklaus could improve on this. He could put the brake on harder and sooner. Better yet, he could hit a tree. I could make a machine to train on for this. so golfers could get the feel for doing it. "According to the way Nicklaus does it. the downswing is initiated with the legs and hips, which begin to go forward before he finishes his backswing. His legs go laterally. his hips rotate, but everything stops at impact. "With President Ford, the legs and hips go pretty much in the same direction. towards the target, even as he hits the ball. He actually has a smoother swing than Nicklaus. and a faster over-all swing velocity, but his timing is not as good. He can't snap the club as well. Even if Mr. Ford should do it exactly the way Nicklaus does. he wouldn't hit the ball as far, but he would hit a% far as he could. Everyone has an optimum capability they must try to attain. "Some body segments act as movers. some as stabilizers. The legs are stabilizers. Try swinging a golf club wearing smooth-soled shoes while standing on ice or on a skateboard. The legs must counteract the forces produced by the swinging motion of the arms and club. It is not likely an efficient swing could be produced in such a slippery situation. You would slide backward with a force equal to that produced by the swing. "The legs are important as stabilizers. Try shooting a cannon from a canoe, and you will appreciate the contribution of stabilizers." pared to the passive movement of Ford's figure. Note also in the Nicklaus figure, that the left arm is perfectly straight whereas in Ford's it has begun to how outward. of improvement. The way to measure this is to track the center of gravity (c.g.). President Ford shifts his c.g. from a position 30 centimeters (cms) behind his left foot to 19 cms behind it, a displacement of 1I cms Nicklaus' e.g. moves only three cms, the difference indicating Nicklaus uses a more rotary than linear shifting of his body. "Now a rotary movement also minimizes the vertical shifting of the c.o. Ford's swing changed the height of his c.o. (raised it), while Nicklaus' remained nearly constant. Ford's pattern is inefficient. It can cause the player to top the ball or hit it after the club has passed perpendicular. "Apparently, golfers require minimum leg movement. But this should not be interpreted to mean the lees are unnecessary. When you fire a cannon from a solid position on the ground, the ground does not move. This does not mean the ground does not contribute to the shot. Shoot a cannon from a canoe and you will appreciate (tic contribution of the ground." Ariel acknowledges that if a person has inherently greater strength than another in certain body segments, that is the rub of the green; an advantage, providing the stronger one uses his gift. Jack Nicklaus does use his heavy, strong legs to good advantage. Other lesser endowed golfers find ways to compensate. Sheer strength is not the be-all, end-all, as Ariel appraised the fact that Ben Hogan won almost all his major championships after his nearly fatal auto-bus collision, which, among other things, seriously damaged his legs. Ariel believes the injury may have made Hogan's legs less active in his swing, which enabled him to better retain his center of gravity. More stable below, Hogan thus used his upper body more efficiently. 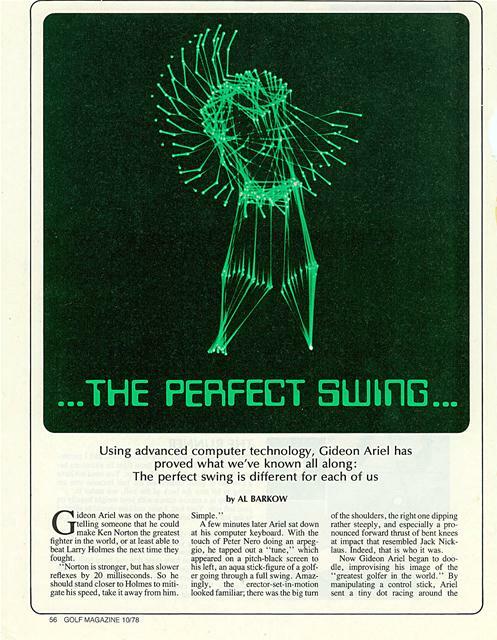 Have Gideon Ariel and his computer readouts revealed anything serious golfers and golf teachers have not already discovered over the many years of cogitation and experimentation? Perhaps not. In his notions of stopping the body at impact. rotating the hips, letting the cluhhead work like a whip, for example, echo familiar ideas couched in different terminology, i.e., "hit against the left side," "turn," "swing the cluhhcad." Ariel does not claim he is golf's latest Magellan charting new passages to the games secret treasures. He justifies his work with a fair-sounding argument. To wit, although much of what has been learned up to now about golf technique has been on the mark, it has resulted essentially from guesswork. "The human eye cannot quantify human movement," says Arid. 'The important things-timing. relative speeds of dozens of limbs and body scornents. changes in centers of gravity--must be measured, weighed and compared to be of value. The best coaches cannot sec these things with their own two eyes. Even exterior movements, which they can see, are hard to follow. They happen too fast. How can anyone see the position of the clubfacc at impact when the ball is on the clubface less than one millisecond, .8, to be exact'? A coach or player may guess right, hut, if not, much time is lost, maybe a career, from taking the wrong tack." 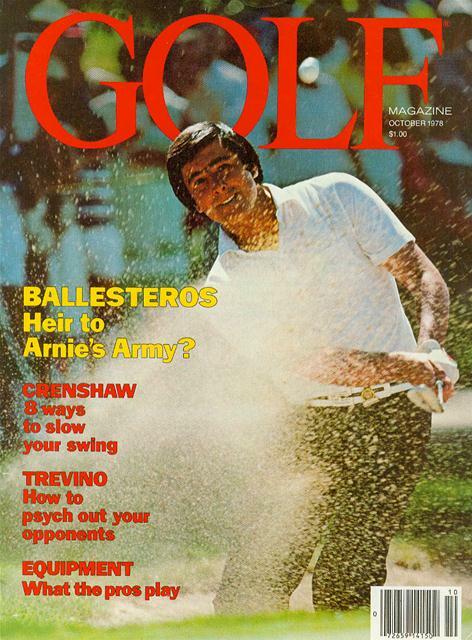 It must he admitted that although Ariel had never before studied the golf swing , with or without computers, in a couple of days he had arrived at certain widely accepted elements of technique that have taken hundreds of golf teachers/students a few decades to reach. He feels sure that while he has never played golf (enthused by his analysis of Nicklaus-Ford, however, he is anxious to get into it) he will become a better player faster than another beginner without his knowledge. "For one thing," says Ariel, "I wouldn't give much attention to minwte details like where my thumb is on the handle. They are not so important. " Quantification is what Gideon Ariel is up to. It may not be the final solution to the eternal puzzle that is golf, but it fills a few gaps. The Tour pros have been going in this direction on their own in stepping off yardages and speaking of having 171 yards to the pin. Such precise accounting seems silly at first glance. What is the difference between 171 and 173 yards on the swing to be made? Maybe more than the old "feel it in the hands" crowd is willing to admit. Generated on 4/24/2019 9:28:01 AM (PST) ADI/HQ/GBA/2019/ARIELCLOUD/v3.0.2018.0126.